So I started blogging less than 2 months ago. Now I'm getting awesome people giving me local produce from their gardens to bake with. Great! Love it! Except a lot of times, I'm not genius enough to come up with a recipe tailored to that produce upon receiving said produce. So when my co-worker brought in these gorgeous Italian Plums from her tree, I cheated. I looked up someone else's blog and took this recipe. And the worst part? I don't even know who it is. Fail. 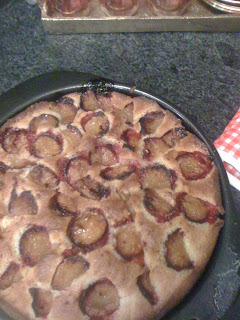 The cake is pretty good though...mostly owing to the deliciousness of the plums. Pre-heat oven to 375 degrees F. Spray a pan (8x10 is good). Mix everything on the list except the last 5 items. Pour batter into sprayed pan. Cut up plums into quarters. Spread around cake. Cut up tablespoon butter into little pieces and spread on top of cake. Sprinkle with cinnamon and brown sugar. Bake 40 minutes.